WASHINGTON (CNN) -- After e-mail pleas and nationwide canvassing, President Obama's political arm has made a TV ad that will air Thursday, urging voters to pressure Congress to approve his $3.6 trillion budget. 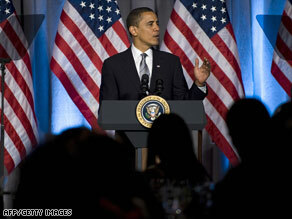 President Obama, here at a Washington fund-raiser Wednesday, hopes a new TV ad will buoy his initiatives. "America is facing tough times," the narrator says in the 30-second ad. "President Obama has a plan to get our economy moving again, to cut the deficit in half and create jobs by investing in health care, energy independence and schools. "Thousands are going door-to-door as part of Organizing for America, gathering support for President Obama's plan to invest in America's future. You can help, too. Call Congress and tell them to support President Obama's budget plan to get our economy moving again." The ad features video footage of a national door-to-door canvassing drive held last weekend by Organizing for America, Obama's presidential campaign organization, which has been folded into the Democratic National Committee. Natalie Wyeth, OFA's spokeswoman, said this is the organization's "first ad as a project of the DNC." "The ad will run on national and D.C. cable, primarily MSNBC and CNN," she wrote in an e-mail. "This is just one of the many tools we'll provide our supporters with, to help them make their voices heard and send a strong signal to Washington that the time for change is now." Interest groups are also running separate television and radio ads in support of Obama's budget. Earlier in March, the DNC ran an ad on cable television in South Carolina criticizing Republican Gov. Mark Sanford for refusing to accept all the stimulus money set aside for his state. Sanford has said that South Carolina would be forced to search for replacement funding once the stimulus money ran out, or be forced to make cuts.